Using iCloud on your iPad opens up so many options for syncing your devices. 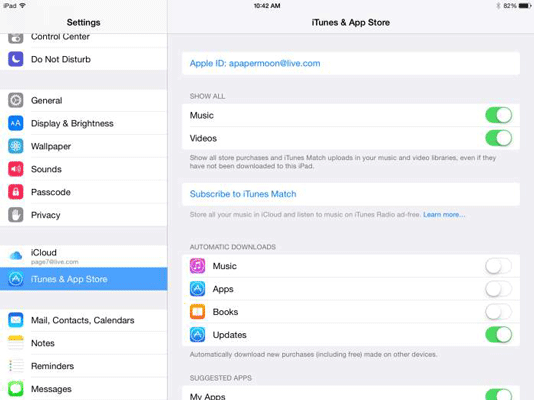 With iCloud, after you set up an iCloud account, either during the initial setup of your device or through iPad Settings, you can make a purchase or download free content on any of your Apple devices that have been set up for auto-download, and you can have those purchases automatically copied onto any or all your Apple devices. In the options that appear, tap the On/Off switch to turn on any category of purchases you want to auto-download to your iPad from other Apple devices: Music, Apps, or Books. At this point, Apple doesn’t offer an option of auto-downloading video content using these settings, probably because video is such a memory and bandwidth hog. You can always download video directly to your iPad through the iTunes Store app or sync to your computer using iTunes to get the content or through the iTunes U app for educational content.